The error code can be different from the 0x8007025D – 0x2000C shown above, including but not limited to 0x800040005 – 0x2000C, 0xC19000101 – 0x2000C, 0x80070216 – 0x2000C, 0x80070570 – 0x2000c and more. The exact reason for the failure to upgrade Windows 10 is unknown, as the description for the error is pretty vague. It’s also possibly that the causes are too broad and many, proven by the many resolutions been offered by users that may resolve the issues in one but not the others. 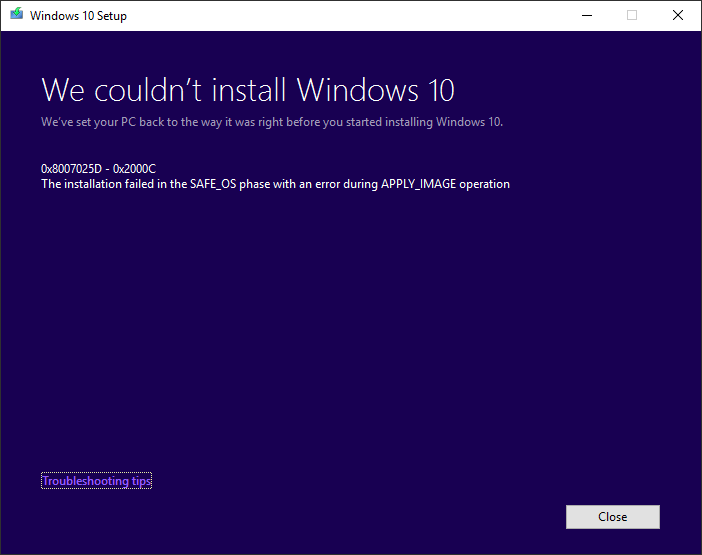 Anyway, if you’re facing the dread “the installation failed in the safe_os phase with an error during apply_image operation” error when upgrading Windows 10, you can try the following methods to see if any of them fixes the upgrading failure problem. Uninstall anti-virus, anti-malware, anti-rootkit, anti-malware and any security or firewall applications such as those from Symantec, Microsoft Security Essentials and etc. The error may be caused by corrupted installation media. Recreate the Windows 10 USB, DVD or ISO installation media via official Media Creation Tool, or re-copy the ISO files, in case the current one is corrupted. To ensure the integrity of ISO or ESE files, check and verify the hashes. Unplug all external devices especially USB devices such as mouse and keyboard. Ensure that device drivers for all devices are up-to-date. Disconnect from network, including LAN, WAN and wireless. Disable Bluetooth adapter in Device Manager or BIOS. Disable Wi-Fi adapter in Device Manager or BIOS. Uninstall utility software that adds extra devices to the system, such as WinVNC (adds virtual display), DVD burner software (adds DVD drive) and etc. Run Disk Cleanup tool to clean up all files including system files. Delete content of C:\Windows\SoftwareDistribution\Download folder. Replace memory module with another stick to rule out faulty RAM module. Run “sfc /scannow” to fix system corruption. Run Windows Update Troubleshooter in Windows 10 Control Panel, or reset Windows Update components in Windows 7, Windows 8 or Windows 8.1. Run Check Disk (chkdsk) to check the disk drives for any errors, and automatically fixes them. In Services.msc, set the startup type of BITS (Background Intelligent Transfer Service), Windows Update and Cryptographic to Automatic. Ensure that all available updates, including optional updates, are installed before upgrading. Free up more disk space, or run the Windows setup from another drive (by copying the content of ISO) or installation media (by creating USB or DVD). Disable UEFI boot in BIOS. Update BIOS to latest firmware version. Increase the size of the System Reserved partition from 100MB to at least 500MB. Reset the Windows 10 via Settings -> Update & security -> Recovery. You can try to keep your files and apps, but if it doesn’t work, keep just your files. Worst case scenario you will have to reset to fresh clean state. With so many possible remedies, but it may still does not resolve the Windows 10 upgrade issue. If any of methods is working for you, or you know of any other working solutions, do share with us in the comments.